The 2018 EPIIC Symposium on Is the Liberal World Order Ending? The 2018 EPIIC Symposium on "Is the Liberal World Order Ending?" “When we say is the liberal world order over? I say, no, it’s not, but multilateralism is challenged as it has never been before, and it will require all of us to really get up and put our muscle behind it. It is a collective responsibility. It is our home. It is our humanity.” With those words, Deputy Secretary-General of the United Nations Amina J. Mohammed inspired the auditorium in her keynote address on “Repositioning the United Nations: Reinforcing Multilateralism in a Challenging Global Context” for the 33rd annual Norris and Margery Bendetson EPIIC Symposium. From March 1 to 3 the EPIIC symposium addressed the question: “Is the Liberal World Order Ending?” bringing together 31 scholars and practitioners from the United States and abroad, the symposium explored a variety of issues including the role of the United States in the liberal world order, the rise of populism and nationalism, the global nuclear dilemma, and the future of the Responsibility to Protect (R2P) doctrine. The speakers included several Tufts faculty from The Fletcher School of Law and Diplomacy and the College of Arts and Sciences. The symposium’s opening panel on “Beyond Borders: Contending with Transnational Challenges”, which focused on migration, climate change, and terrorism, addressed the question of whether states will choose to confront today’s challenges together or try to go their own ways. Samantha Gross of the Brookings Institution noted the impact of the growing mistrust of multilateralism, especially for climate change. Andy Knight of the University of Alberta, speaking directly to the issues faced by Small Island Developing States (SIDS), commented that global security and global governance were absolutely necessary because the threats of today cannot be contained within national boundaries. He added that the interconnectivity of vulnerabilities, especially for small states, demanded that governance happen at multiple levels – local, national, and international – simultaneously. The symposium also included expert-led, small-group discussions on issues ranging from corruption and the neo-liberal world order to U.S. Russian relations to climate change and geopolitics in the Arctic Circle. The discussion on “The Indian Subcontinent and the Liberal World Order” featured Tufts University Professor Ayesha Jalal and Harvard Professor Sugata Bose and highlighted concerns about the colonial underpinnings of liberalism. The discussion on "Religion: Ally or Opponent of the Liberal World Order?” was led by Harvard University Lecturer George Soroka and explored whether religion was a force that promoted the liberal world order, or whether it was an excuse or tool for extremism, inhumanity, and conflict. Robert Stoner, Deputy Director for Science and Technology of the MIT Energy Initiative, led a session on “Energy Security and Technology in Developing Countries”. Fletcher Alumnus and former Speech Writer for Vice President Biden Daniel Benaim opened his remarks about the U.S. and the liberal world order with a nod to the weather, commenting that he had “rarely been to a conference when the weather outside so perfectly matched the mood indoors.” The symposium occurred amidst a rain-whipping Nor’easter that shut down air and train travel on the northeast corridor, though many of the panelists made impressive efforts to join the discussions. Visiting delegations of students, both from outside the U.S. as well as from chapters of the IGL’s ALLIES civil-military program, participated in the symposium, engaging each other and the speakers on the symposium’s issues. 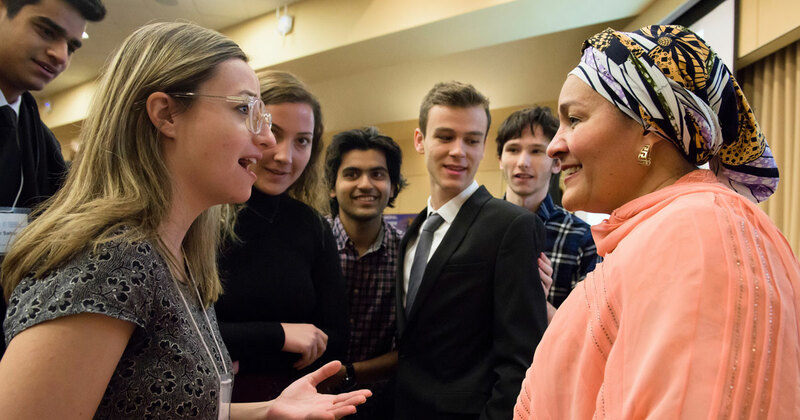 The international delegations came from Brazil, China, Ireland, Israel, Russia, and Singapore and spent a week at Tufts in a range of activities in addition to the symposium. Feodor Voytolovsky, Director of the Primakov Institute of World Economy and International Relations at the Russian Academy of Sciences in Moscow, was the recipient of the Robert and JoAnn Bendetson Public Diplomacy Award. In accepting the award, he said that it was a special honor for him and to be recognized for his work in promoting Russian-American relations. He added, “In the current world, we academics are becoming a little more than just researchers…we are becoming a little bit like diplomats.” He emphasized that it was important now more than ever before, for academics to help policymakers understand the complexities of global issues.